Those words were uttered, audibly and unironically, in my classroom a few weeks ago. 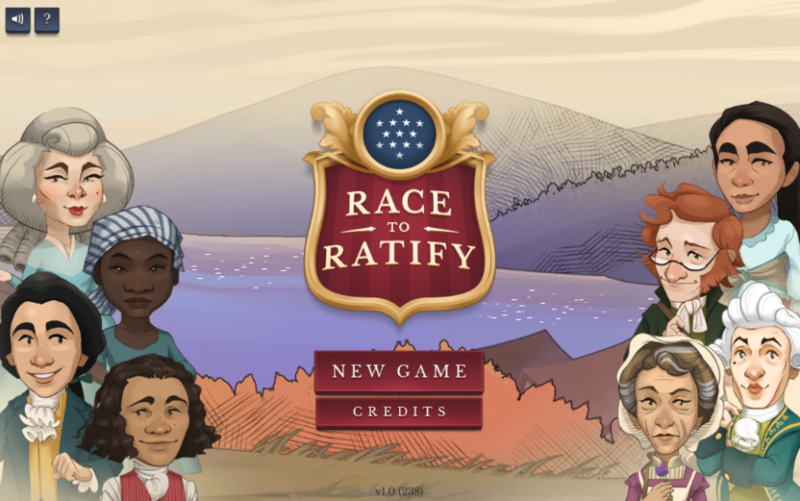 They came from a young woman trying to secure ratification for the U.S. Constitution in the new game Race to Ratify! Students in my AP U.S. Government and Politics class were lucky enough to get a sneak preview of the game and help with its finishing touches. Several times now, my students have had the pleasure of “play-testing” new or reworked iCivics games due to my serendipitous location in Madison, Wisconsin (home to iCivics game design firm, Filament Games). I was looking forward to this game in particular because teaching about the Constitution, be it ratification or the intricacies of the Commerce Clause, is one of my favorite things to do as a teacher. The historical aspects, however, are especially difficult to make engaging and relevant for students. After seeing two classes worth of students confer with their neighbor about who had the stronger Federalist arguments, and curse out the rival pamphleteer as he hopped from state to state, I’ve determined that this game is a winner, and one that will be part of my course curriculum for a long time. Inviting strangers into your classroom can be an uncomfortable and intimidating experience. Several times a semester I bring in guest speakers and a few times a year, there is a roving administrator, but bringing in professional who need input from your students to do their job, is another experience altogether. For the past several years, I have been part of the iCivics Educator Network (a group of teachers and education professionals who support their work), and part of my relationship with this organization has involved opening my classroom to have my students help them. Typically, our visitors arrive with a game pretty well formed. They often need input on the gameplay experience, the user interface, and whether the game is fun and engaging. The chief benefit of being a playtest destination is that my students feel ownership for the games they play. This makes asking them to play a game where they have to learn something much easier. To be fair, iCivics games are great. They are perfect for the classroom, but teachers know we can’t compete with the “real games” they play at home. Telling students they will be playing an educational game is always fraught with peril and often met with skepticism. Making students part of the creation of those games has real value and creates instant engagement. Needless to say, the struggle to ratify is real. The Constitution seems like an inevitability in the eyes of students reading it for the first time. It’s like wading through a reverse Choose-Your-Own-Adventure novel. When you already know we ended up with a Constitution, what fun is it to explore how we got there? If history is written by the winners, it should be easy to tell why March 1st isn’t a holiday. Wait, you didn’t know that was the date the Articles of Confederation were ratified? This is what makes Race to Ratify! so much fun. It takes fairly stodgy time period, coupled with nuanced argument and language, and creates a game that actually engages students. You could have students conduct a “close reading” of the compiled Federalist Papers (though, really, they do need to read some of them) or they could learn the cogent and varied arguments of Federalists and Anti-Federalists on a virtual game board. This game will be a regular feature of my AP Government class. This time around, we played prior to analyzing the ratification debate. My students played the game without much background regarding the problems of the Articles or the main points of either side. It worked well. The game taught them what they needed to know. As they played, we likened “pamphleteering” to modern social media, and they made an immediate connection to their role in a non-digital world. The game was a great hook to our discussions in successive days. Students definitely retained knowledge of the essential arguments and it helped them understand how the Anti-Federalist objections impacted things like the debate over the Bill of Rights. This game can be useful in a number of types of classes and at several levels. It is definitely robust enough that my 12th grade AP students were challenged and engaged, but the gameplay is friendly enough for middle schoolers. Race to Ratify! fits great in the civics or government curriculum to help bring to life a fuzzy but essential time period. For American History classes, it helps students connect the historical to the practical and political. The game works either as a preview or review of material. In future years, I will use it as a review. Once students have a bit of background about the arguments and the structure of ratification, it makes starting the game a bit easier. Pedagogically, the game does a better job of making this debate seem real than any reading or direct instruction that we might do. There is only so much that a Federalist/Anti-Federalist T-Chart can convey. Playing as a review leads to higher level questions from students too. When students have to take their knowledge and use it to think strategically, they read closer and think through problems more carefully. For teachers of younger students or on-level civics classes, the iCivics curriculum team has constructed solid support materials to accompany the game. The game makes me excited to teach this content again. Students like it, and even if they don’t win, they might still learn something. David Olson teaches at James Madison Memorial High School in Madison, WI. Beyond teaching AP U.S. Government and Politics and Criminal Justice, David helps spread his passion for civic education by serving on the iCivics Educator Network, the Teacher Advisory Board for the National Constitution Center in Philadelphia, and the Wisconsin Council for the Social Studies (WCSS) Board. In 2017, David was chosen as the WCSS High School Teacher of the Year and as a PBS Digital Innovator and Innovator All-Star in 2017 and 2018. He was recently honored with the Civil Rights and Civil Liberties Excellence in Teaching Award by the Wisconsin Council for the Social Studies.